Wakehurst Football Club has announced an exciting new sponsorship deal with the locally-based Leighinmohr House Hotel. The Leighinmohr Avenue venue will become the Championship Two side’s principal sponsors under the new rolling agreement. We have ambitions, both in terms of establishing ourselves as a Championship team on the pitch and off it, our goal still remains to get back to playing home matches in Ballymena at some stage and the type of support we receive from Leighinmohr House Hotel is invaluable. “It’s a superb deal for the club and sponsorship of this kind is absolutely vital for clubs like ourselves who have very little in terms of resources,” said club chairman Billy Erwin. “We will use the hotel as our base, for meeting before leaving to go to matches and we’ll also use the Leighinmohr for club functions like our end of season dinner, night at the races and quiz so we reckon it’s a very good fit between ourselves and the Leighinmohr House Hotel. “We have ambitions, both in terms of establishing ourselves as a Championship team on the pitch and off it, our goal still remains to get back to playing home matches in Ballymena at some stage and the type of support we receive from Leighinmohr House Hotel is invaluable,” added Billy. Adrian Fullan, joint owner of the hotel, said: “We have shown our ambition with the refurbishment work we have done at the hotel and that sort of ambition is matched by what Wakehurst is trying to achieve. 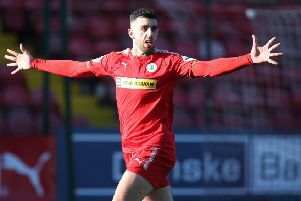 “Billy and I have been speaking about this for some time and it’s clear to see the passion he has for the club and we are delighted to be involved in that,” added Adrian, a keen football fan who formerly played for Portglenone in the Ballymena Premier League. Meanwhile, on the pitch, Wakehurst were unable to extend their recent improved run of form as they lost 2-0 to Dollingstown at Mill Meadow on Saturday. “We got what we deserved from a fairly nondescript performance,” admitted manager Ian Gregg. “It was a game that hinged on two penalty decisions - they got what we thought was a very soft penalty and scored it and then in the second half, Conor Gregg hit the crossbar with a penalty after he had been brought down. “They scored another goal in the second half to kill the game off but it’s another of those situations where, had we scored, the complexion of the game might have been completely different,” added Gregg. Wakehurst: Maybin, Colville, Crawford, Swan, Erwin, Gilmore (sub Lemon), Laughlin, Young, Millar (sub R Gregg), Foster, C Gregg (sub Speirs). Subs (not used): Stevenson, Price. Wakehurst travel to Tobermore United this Saturday.